The third European single from "Lifelines" is "Did Anyone Approach You?". The cover features a very blurred purple tone shot of the band. 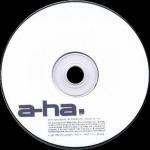 The a-ha logo and title are printed in white letters across the sleeve. There is a white border around the picture. The CD includes the following tracks: Did Anyone Approach You? (Original Album Version), Did Anyone Approach You? (Turner Remix), Did Anyone Approach You? (Reamped), Did Anyone Approach You? (Tore Johannson Remix), Afternoon High (Demo Version) and Did Anyone Approach You? (Video Clip). The German release is limited to 20000 copies and has the unique limited number printed in the top right hand corner of the sleeve. The Norwegian release has not been assigned a limited edition number. A 2 track CD single was available in Norway. It features the Original Album version of "Did Anyone Approach You?" plus the Demo Version of "Afternoon High". The 2-track single was scheduled for release in Sweden on 31st December 2002, but was cancelled and there was no release of "Did Anyone Approach You?" in Sweden. The promo single has a similar sleeve, but includes only the album version of "Did Anyone Approach You?" (4:10). The disc is white with a dark blue logo on the bottom left hand side. Some copies of the German promo come with a wea records press sheet with information on the band plus German tour dates. Israel: The German 6-track single was used for promotional purposes in Israel and comes with a Hebrew sticker on the front of the case and a "not for sale" sticker over the barcode on the back.